Dr. Seema Alam established the first ever department of Pediatric Hepatology in the country. The department has achieved various milestones since then: starting the Pediatric Liver Transplantation program in September 2011 where we have transplanted 35 children, initiation of Post-doctoral Certificate Course in Pediatric Hepatology in January 2013 and we have finally trained 6 PDCC fellows successfully. The DM program in the specialty from September 2013 – nationally the first ever and only training in this superspeciality is in its fourth year. Number of children attending out-patient clinic as well as those admitted in the wards have been increasing steadily. 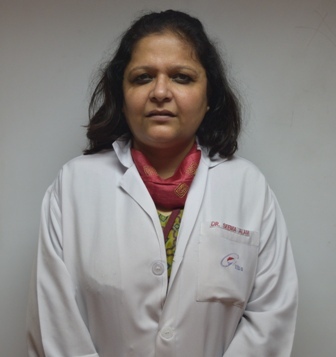 She is keenly interested in metabolic liver disease and her earnest enthusiasm has helped create widespread awareness about such disorders among pediatricians and adult gastroenterologists. She attended the APASL 2014 & 2015 conference at Brisbane & Istanbul respectively, where the organizers were persuaded to add a more organized Pediatric Hepatology session. Clinical Scenarios in Paediatric Liver disease was an idea introduced by her and it is successfully running in its fourth year. Awarded the prestigious “Mehta Mittal Shankarnarayanan Oration" award for the year 2018 for her achievements in the field at the 5th Annual Conference of the ISPGHAN held in Mumbai on 26th-28th October, 2018. AIIMS on 10th September 2017. Invited expert in 'Clinico-pathological meet' at 3rd Annual conference of Indian society of Pediatric Gastroenterology Hepatology and Nutrition (ISPGHAN) held at Kolkata on 23-25th September, 2016. Invited expert at Hepaticon 2016 held in Mumbai, India in April 2016. 5. Invited expert at ''Master Class in Liver Disease 2016' held in Chennai,India in January 2016. Renal involvement in pediatric liver disease- Spectrum, Outcome and management. Hepatitis A Virus Related Pediatric Liver Disease Burden: Need for inclusion of its Vaccination in the National Immunisation Program? Clinical and Prothrombotic Profile of Hepatic Vein Outflow Tract Obstruction. Accepted manuscript in Indian J Pediatrics. Non-cirrhotic portal hypertension. Accepted manuscript in Journal of Hepatology. Clinicopathological Conference - Neonatal cholestasis with ductal paucity and steatosis. Indian Pediatrics March 2013;50(16):316-320. Phenotypic Variation and Long-term Outcome of Children with Congenital Hepatic Fibrosis. The Water Halo Sign with Calcium. J Pediatr 2013 Apr 25. doi:pii: S0022-3476(13)00320-X. 10.1016/j.jpeds.2013.03.044. [Epub ahead of print]. Congenital Extrahepatic Portocaval Shunt with Trisomy 8 and Ductal Paucity. Under peer review in J Pediatr Gastroenterol Nutr. The efficacy of zinc supplementation in young children with acute lower respiratory infections: a randomized double-blind controlled trial. Clin Nutr. 2013 Apr;32(2):193-9. doi: 10.1016/j.clnu.2012.08.018. Epub 2012 Aug 31. IgA anti-tTG antibodies in children with severe short stature without gastrointestinal manifestations. Indian J Gastroenterol. 2012 Jan;31(1):32-3. doi: 10.1007/s12664-011-0160-2. Epub 2012 Feb 4. Novel nonsense mutation of ABHD5 in Dorfman Chanarin syndrome with unusual findings: A challenge for genotype phenotype correlation. European Journal of Medical Genetics 2012; 55:173-177. Anomalous Pancreaticobiliary Junction (APBJ). J Pediatr Gastroenterol Nutr. 2012 Apr 24. Efficacy and Safety of Saccharomyces boulardii in Acute Childhood Diarrhea: A Double Blind Randomised Controlled Trial. The Indian Journal of Pediatrics (2011): 1-5, October 14, 2011. Determinants of vitamin A deficiency amongst children in Aligarh district, Uttar Pradesh. Indian Pediatr. 2011;48:861-661. Long-term follow-up of children with 6-thioguanine-related chronic hepatoxicity following treatment for acute lymphoblastic leukaemia. J Pediatr Gastroenterol Nutr. 2011 Nov;53(5):478-9. Potentially Modifiable Micro-Environmental and Co-Morbid Factors Associated with Severe Wasting and Stunting in Children below 3 Years of Age in Aligarh District. Indian J Community Med. 2010 Apr;35(2):353-5. Global developmental delay and its determinants among urban infants and toddlers: a cross sectional study. Indian J Pediatr. 2010 Sep;77(9):975-80. Screening children with severe short stature for celiac disease using tissue transglutaminase. Indian J Pediatr. 2010 Apr;77(4):387-90. Management of acute diarrhea: from evidence to policy. Indian Pediatr. 2010 Mar;47(3):215-7. Rational drug Therapy, chapter in the Book 'Acute Diarrhea' edited by A K Patwari." Publisher Elsevier. "Inborn errors of Metabolism" chapter in the textbook of Biotechnology. Delivered a lecture on"Etiology of chronic liver disease: Indian Perspective" at PEDGASTROCON 2012, 22nd National Conference of Pediatric Gastroenterology, Hepatology and Nutrition held at SGPGI, Lucknow on November 2-4, 2012. Delivered a lecture on "Pediatric acute liver failure" at TRANCRIT 2012 - Symposium on "Acute Liver Failure: From Critical Care to Liver Transplantation" at ILBS April 22, 2012. Chairperson for a session on Neonatal Cholestasis. Liver Histopathology conference at GB Pant Hospital, on January 20-21, 2012. Delivered a lecture on "Metabolic liver disease in Pediatric acute liver failure" at APASL school of Hepatology, at ILBS Jan 15, 2012. Poster presentation on "Hepatocellular carcinoma in an adolescent with celiac disease" at International Symposium on HCC titled "Management paradigms for Hepatocellular Carcinoma: Current and Future." at New Delhi on April 7-8, 2012. Oral presentation on "Transient elastography accurately predicts fibrosis & complications of portal hypertension in children" at PEDGASTROCON-2012, 22nd National Conference of Pediatric Gastroenterology, Hepatology and Nutrition at SGPGI, Lucknow on November 2-4, 2012. Poster presentation at "Protocol based diagnosis and management of Metabolic liver disease" at ISGCON 2012, Annual Conference of Indian Society of Gastroenterology, at Jaipur from November 29-December 2, 2012. Won the best poster award. Delivered a lecture on “Drug Induced Liver Injury” at the Kunwar Viren Oswal Postgraduate Course in Pediatric gastroenterology & Hepatology. Apollo Hospital, Delhi on 28 Aug-1st Sep, 2013. Delivered a lecture on “Role of anti-oxidants in children with NAFLD” at NAMS PGI symposium on Non-alcoholic fatty liver disease in children and adolescents at PGIMER, Chandigarh on 10th March, 2013. Delivered a lecture on “Approach to Metabolic Liver disease in children” at PEDICON 2013 at Kolkata on 7-10th January, 2013. Moderator for a case discussion on “Splenohepatomegaly in a child” at Pediatric Liver Foundation Meet at Mumbai on 14-15th December, 2013. Moderator for a case discussion on “Hepatomegaly in a child” at Children’s Liver Disease Foundation Meet at Mumbai on 14-15th December, 2013. Moderator for a case discussion on “Cholestatic liver disease in a 3-year old child” at Pediatric Liver Foundation Meet at Mumbai on 14-15th December, 2013. Panelist for a case discussion on “Neonatal Liver failure” at Pediatric Liver Foundation Meet at Mumbai on 14-15th December, 2013. Panelist for a case discussion on “Rickets and Liver disease” at Pediatric Liver Foundation Meet at Mumbai on 14-15th December, 2013.